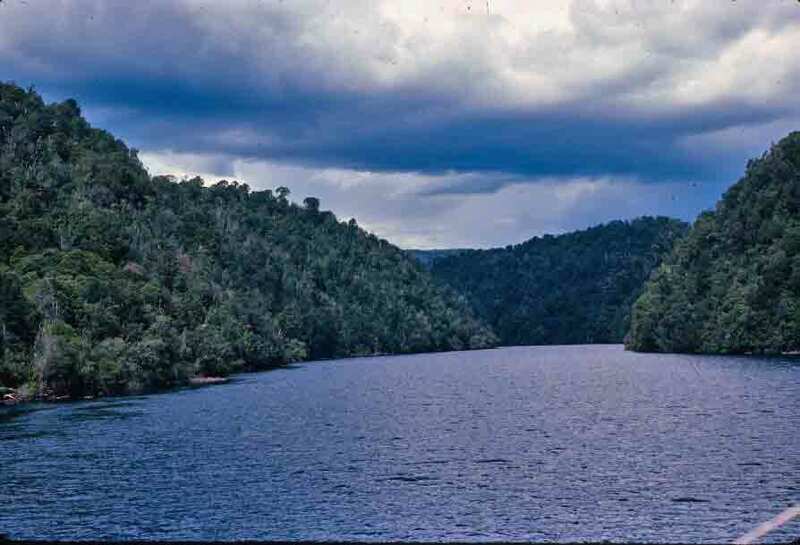 The Gordon River is Tasmania’s longest river. It cuts through an area of incredible wildness—an area that has in fact been designated a World Heritage Wilderness Area. Then, near the coast, the river empties into the broad expanse of Macquarie Harbour. While the history surrounding this river dates back to Tasmania’s days as a convict settlement, in more recent history, this river was the focus of a huge environmental controversy that broke out, followed by an international campaign beginning in the late 1970s, over suggestions that the powerful river could produce a great deal of hydroelectric energy, if it were dammed. It was in time decided that the value of the wilderness area was too great to simply flood it, so the area was preserved. The wilderness area is nearly impenetrable. The rivers that feed into the Gordon, the Collingwood and the Franklin, cut through mountains and deep valleys, and have recently become the destination for serious whitewater rafting. But thanks to the dense foliage, including the stunningly snarled “horizontal forest,” the surrounding land remains largely unexplored. Nearer to Macquarie Harbour, the river is gentler, and cruises amid the wilderness and to historic sites are available from the boat docks in Strahan. The distant vistas available from Macquarie Harbour vanish as a tidal wave of greenery closes in around the river itself. It was to be a splendid day. The Roaring Forties is the name sailors gave long ago to the latitudes in the Southern Hemisphere from the fortieth to fiftieth parallel. It is the same latitude range in which one finds South America’s rugged Patagonia. It’s well south of Africa’s Cape of Good Hope. 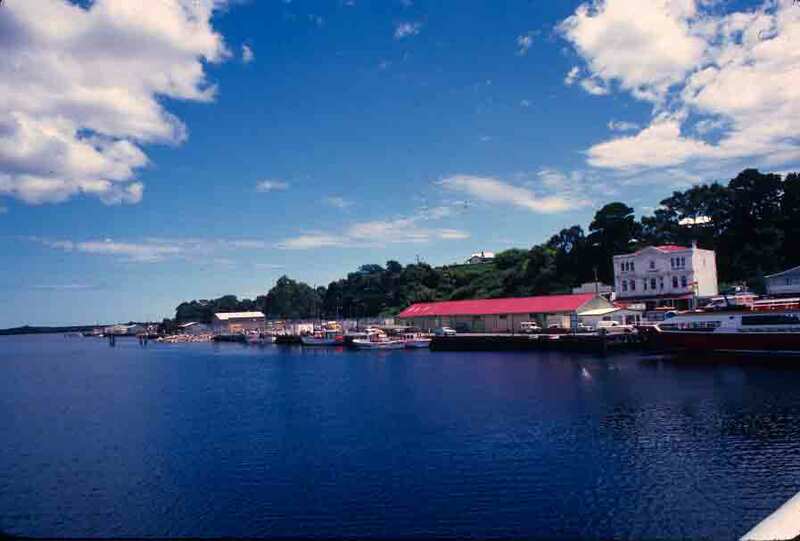 It is also the latitude range in which one finds Strahan, the lovely but isolated fishing village on Tasmania’s west coast that was our next destination. The Roaring Forties are so called because they do roar. Strong, often gale-force winds blow persistently from the west along these parallels, buffeting this coast all year long. The waves that break on this shore have moved uninterrupted from the other side of the world, from South America to Tasmania. Fortunately, Strahan is somewhat protected by splendid Macquarie Harbour. Historically, the town’s income has come from rock lobster. 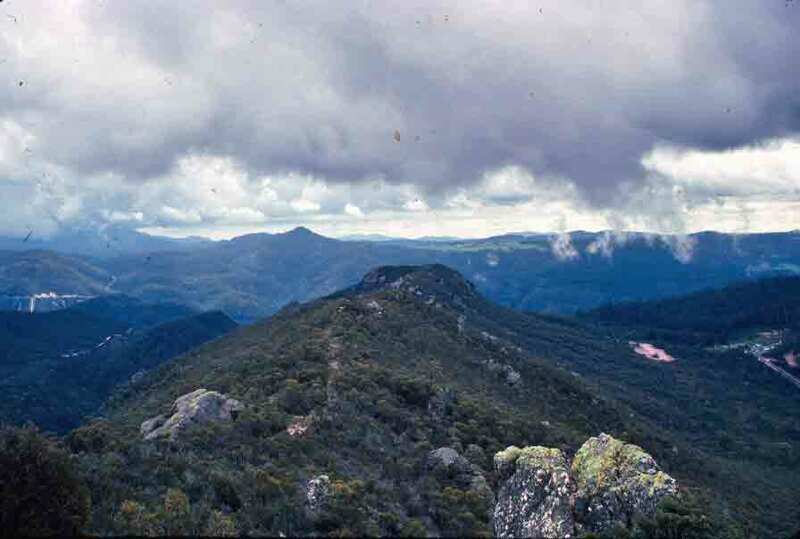 Today, tourism has become a key income generator, because aside from interesting history (this was once the site of a particularly unpleasant penal colony), it is the entrance to Tasmania’s astonishing World Heritage wilderness, an area so densely forested that most of it remains unexplored. We would have a chance the next day to explore more, but that first day, we simply wandered through town, enjoying its charm and the beauty of the location, returning to camp in time for sunset. Tasmania is actually the tail end of Australia’s Great Dividing Range, the range of mountains that runs like a spine down the Eastern seaboard of the continent. As a result, most travel in Tasmania involves crossing mountains. This afforded us frequent glorious vistas during the time we spent traversing Tassie. My first crossing was soon after we left the north coast, heading southward along the west coast. It was a cloudy day, and the clouds were close overhead. Like most of Australia’s mountains, these were not stunningly high peaks, but rather manageable mountains that invited rather than challenged. A brief stop at Round Mountain Lookout gave me an opportunity to photograph, and not just admire, the green mountains and drama of sky and earth. View from Round Mountain Lookout. The Tassie devils were not the only ones to get pushed southward by the arrival of the ancestors of today’s Australian Aborigines. There was an even earlier Aboriginal people group, a different race from the newer Aboriginal peoples, who were pushed off the mainland. By the time Europeans arrived, this other race survived only in Tasmania. The Tasmanian Aborigines lacked many of the skills and technologies (including making fire) that were common among the newer Aborigines, but they still generally ate better because of Tasmania’s abundance. While there are many mixed-blood descendants of the of these people, no pure-blood Tasmanian Aborigines remain. Many of those descendants carry on aspects of that earlier culture, such as specific hunting seasons. However, most of the culture of these very early Australians can only be seen at places like the Tiagarra Aboriginal Cultural Centre & Museum. Splendid, seaside Tiagarra is home to a museum that records the history of the Tasmanian Aborigines, while extensive, beautiful grounds are full or outcrops of rock that bear some of the rock engravings that were the primary art form of these early people. Symbols, signs, and a few rough outlines of fish or emus were painstakingly scraped into the rock. 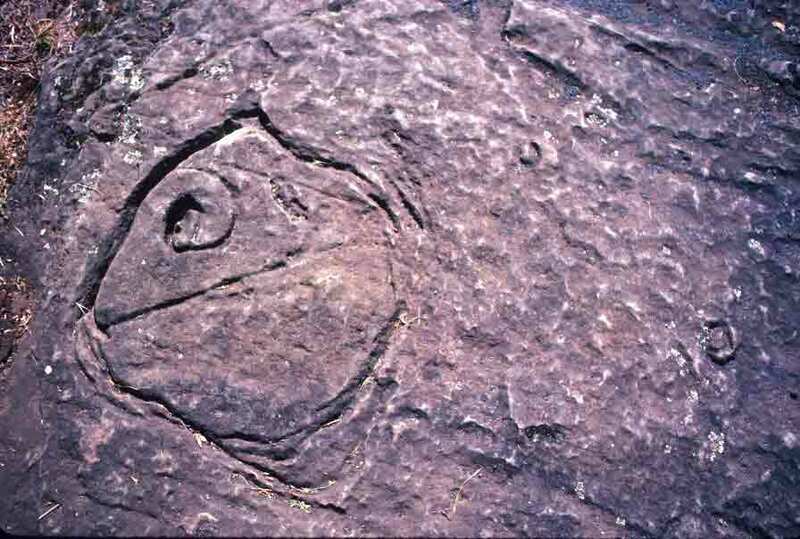 The photo below is one of the these rock engravings, possibly of a fish. Okay—here’s the one you’ve been waiting for: the Tasmanian devil. Echidnas and wallabies are all well and good, but it was the Tasmanian devil that we grew up watching in cartoons. While the whirling of the cartoon character is entirely fictional, the snarling/growling sound is anchored in reality—though real Tasmanian devils sound much worse than the cartoon, adding to the snarling and growling a whole range of barking, snorting, and screaming. Tasmanian devils, like almost all other Australian mammals, are marsupials—they carry their young in pouches. Like the koala and wombat, the Tasmanian devil has a rear-facing pouch. As with other marsupials, the pouch-dwellers are called joeys. However, in devils, the whole early life experience is a bit rougher than it is for most other marsupials. Mom bears up to 50 babies but has only four teats. The tiny newborns have to crawl into the pouch and compete for one of the four teats, to which they attach until weaned. The others just die. After six months, the babies are on their own. If they manage to live to the end of the first year, they’ll probably enjoy a full life—which for a devil in the wild is from five to eight years. Tassie devils are the largest carnivorous marsupials, even though they are only about the size of small dog, and they’re not aggressive animals—unless food is involved. Devils are solitary creatures, but more than one might approach the same carcass (they are primarily scavengers), and the hideous shrieking, screaming, and snarling is how they establish dominance when feeding. The devil has sharp teeth and strong jaws and can deliver a tremendously powerful bite, so it’s not all sound and fury. You don’t want to come between a devil and his dinner. Devils are muscular and quite powerful for their size. Among marsupials, they are odd for having front legs that are slightly longer than their back legs. Nocturnal hunters, these curious, high-energy animals will travel as much as 10 miles a night in search of food. Because they will eat anything, bones and all, no matter how rotten, they are great at keeping the countryside tidy. As the name suggests, Tasmanian devils are found in Tasmania, but there was a time when they were abundant on the mainland. Scientists suggest that their extinction on the mainland was most likely caused by the introduction of dingoes, Asian dogs that were introduced by migrating Aboriginal people. Today, a new threat faces the devils. 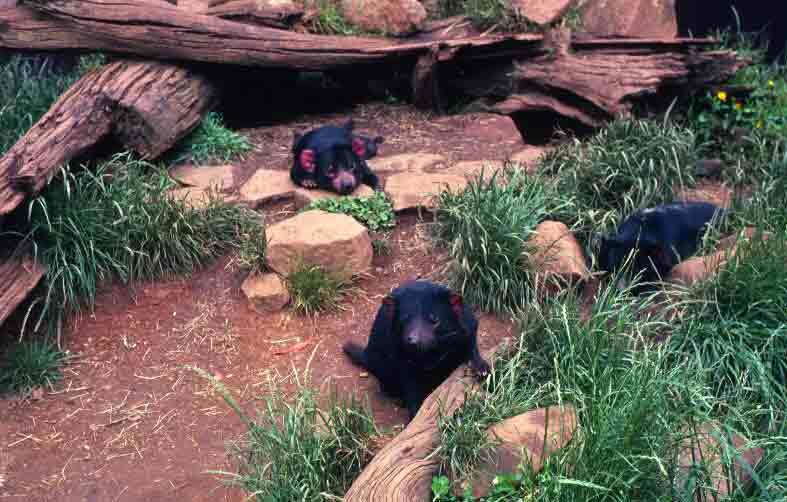 A highly contagious disease called devil facial tumor disease (DFTD) has been spreading since the mid-1990s and has already killed thousands of Tasmanian devils. Animal health experts are working to isolate populations where the disease has not yet appeared, and captive breeding programs of healthy devils have been put in place in an attempt to save the species from extinction. Tasmanian devils have long been protected, but now, because of DFTD, the Australian government has listed them as endangered. I had the pleasure of seeing the devils pictured below when I visited a wildlife park in Tasmania. Because they are nocturnal, one would not normally see them in daylight, and even more rarely see them in groups. The one that looks alert has just awakened from sleep because it caught the scent of an approaching pail of food. The others would soon join him. Fortunately, these captive populations are doing more than just amusing the tourists these days—they’re helping ensure the devils’ survival.